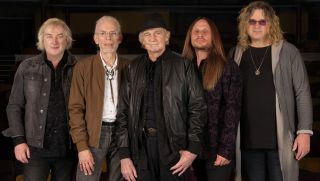 Yes have announced "The Royal Affair Tour," a summer trek that will take the band across the United States—with a date in Toronto, Canada for good measure—from mid-June through late July. Notably, the tour will feature guitarist Steve Howe pulling double duty, as he will play with both Yes and—for the first time since 2012—Asia, who are second on the bill. The trek will also feature John Lodge of The Moody Blues and Carl Palmer's ELP Legacy. "Yes are delighted to headline this celebration of British music which has been so warmly received in America over the past five decades," Howe said in a press release. You can check out the full itinerary of "The Royal Affair Tour" below.